When it comes to analysis of Shi'a militias operating in Iraq, the bulk of the focus has been on the established Iranian proxies, including Asa'ib Ahl al-Haq, the Badr Organization, Kata'ib Hezbollah and Saraya al-Khorasani. 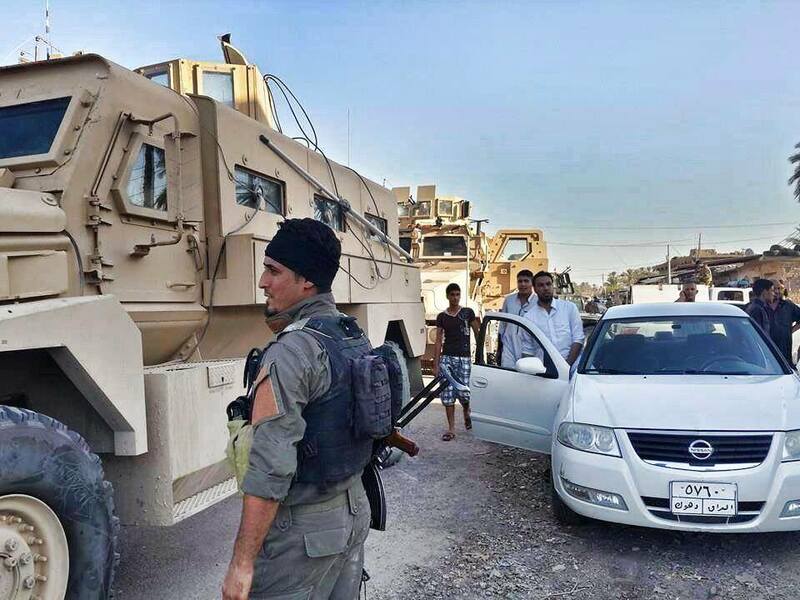 However, there are also many other Shi'a militias, having arisen in the wake of Ayatollah Sistani's call to arms to defend Iraq in mid-June in the face of the threat from the Islamic State. 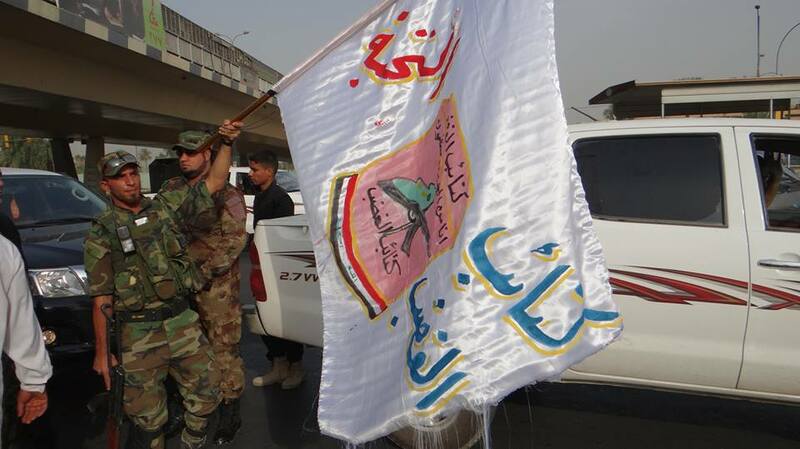 While Sistani's declaration had not been intended as a call for militiafication but rather for enlisting in the regular security forces (such as the army), it was widely received as a justification for what has become known in Iraqi discourse as al-hashad al-sha'abi ('the popular mobilization'), referring to the array of Shi'a militia brands of a variety of leanings that have since popped up. Perhaps the most well-known of these is Saraya al-Salam ('The Peace Brigades'), a revival of Muqtada al-Sadr's Mahdi Army. 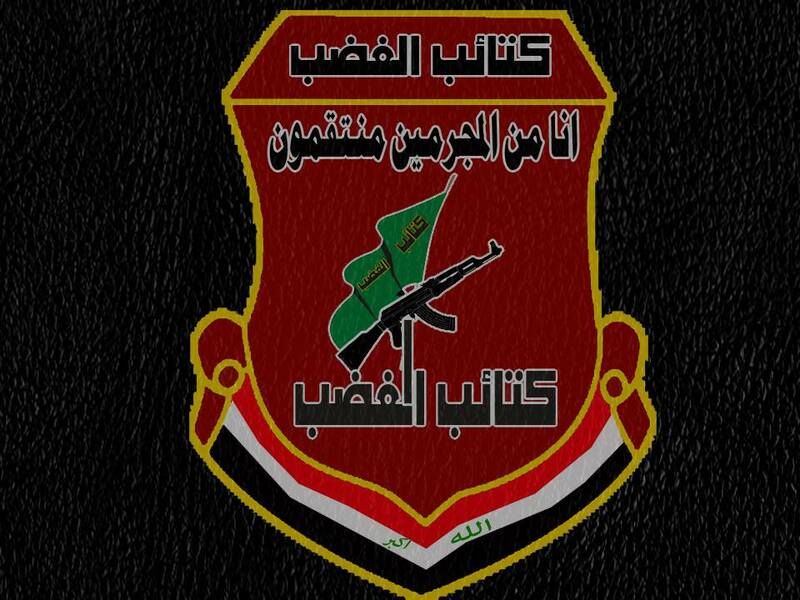 Logo of Kata'ib al-Ghadab, with slogan 'Indeed we are taking revenge on the criminals'. The familiar pose with the rifle is used by a number of Shi'a militias, including Lebanon's Hezbollah and Iraq's Kata'ib Hezbollah. Kata'ib al-Ghadab claims a number of sub-contingents, including: the Abu al-Fadl al-Abbas Battalion (perhaps deriving its name from Syria's Liwa Abu al-Fadl al-Abbas), the Death Battalion (Katiba al-Mawt), the al-Hawra Zainab Battalion (al-hawra being an epithet for Sayyida Zainab), the Knights Battalion (Katiba al-Fursan), the Ali Wali Allah Battalion (as in Imam Ali), the Imam Muhammad al-Jawad Battalion (as in the ninth Shi'a imam), the Snipers' Battalion, and the Special Operations Battalion. The last of these designations is by no means unique to Kata'ib al-Ghadab: for comparison, Saraya al-Khorasani also claims a special operations division. The various Kata'ib al-Ghadab divisions were not all formed at once. For example, the snipers division was, according to Kata'ib al-Ghadab's own website, formed in early August, armed with M24 snipers and to be deployed in the Baghdad Belt area. This similarly applies to the Ali Wali Allah Battalion, which was announced on 13 August following reported completion of military training of its members over the past month and also reported to be deployed to the Baghdad Belt area. Besides these divisions mentioned above, other claimed components include the 'Ashtar Battalion', taking its name from the revered Shi'a figure Malik al-Ashtar. The group's leader is one Abu al-Fiqar al-Shammary, who is a leader in the Islamic Da'wah Party Tanẓim al-Dakhil. 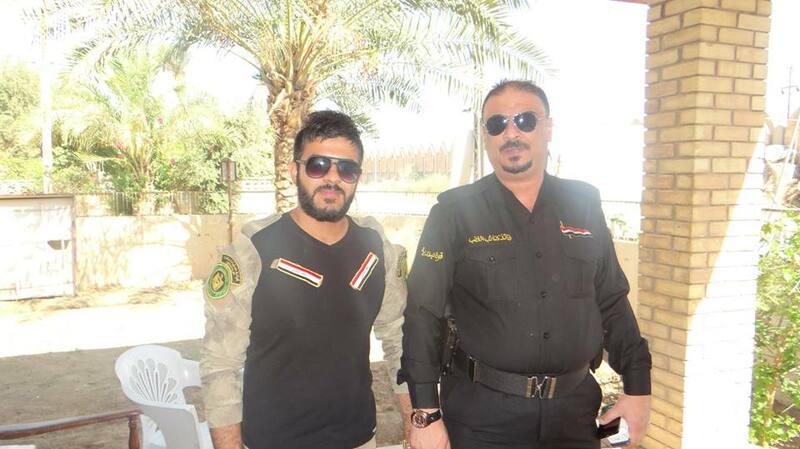 Like Ammar al-Hakim and other mainstream Shi'a political figures who head their own militia brands (thus Ammar al-Hakim and his Saraya Ashura'), Abu al-Fiqar al-Shammary has made an effort to show himself in military guise in some form or another as a means of demonstrating credibility for his militia. Operationally, Kata'ib al-Ghadab has claimed activities in a number of areas, including Amiriya al-Fallujah (an area in Anbar province still in government control), al-Karma (also Anbar province), Diyala province (note the group defining itself as part of al-Muqawama al-Islamiya fi Iraq- 'the Islamic Resistance in Iraq'- a common moniker adopted by Shi'a militias, Iranian proxy or otherwise), north Baghdad province, and Jurf al-Sakhr. In terms of rhetoric, there is nothing particularly egregious by the standards of Shi'a militia discourse, including the labelling of enemies as Ba'athists and 'takfiri Wahhabists', together with the notion of defence of the nation and holy sites. 'War media for the Islamic Resistance [Kata'ib al-Ghadab]'- purportedly from al-Mashahada area, north Baghdad province. 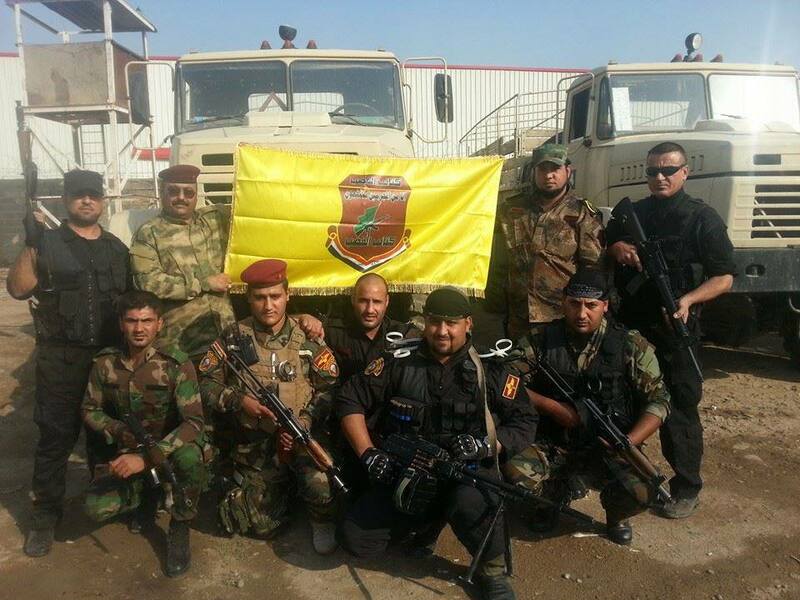 The Assad Allah al-Ghalib [a reference to Imam Ali] Battalion of Kata'ib al-Ghadab purportedly with regular security forces in Dhaluiya, Salah ad-Din province. 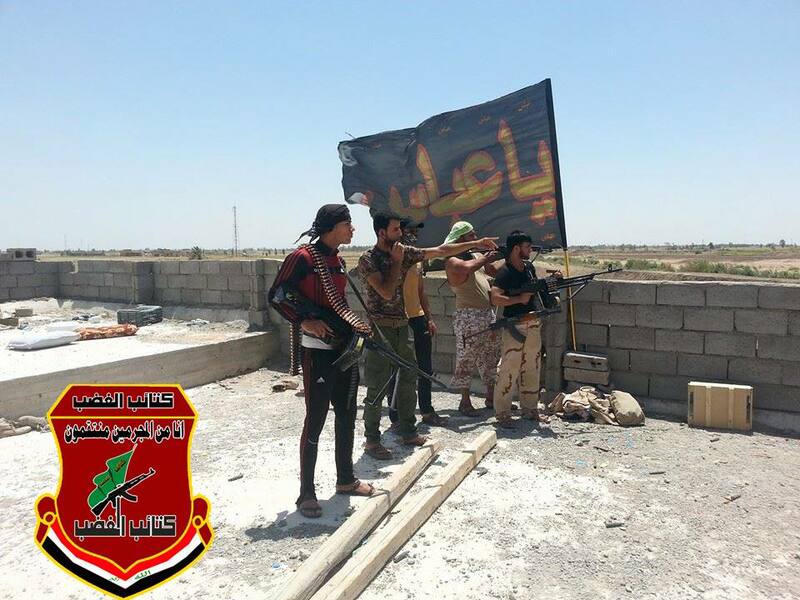 Fighters pose with a Kata'ib al-Ghadab banner. Kata'ib al-Ghadab advertises Shi'a sectarian sloganeering. 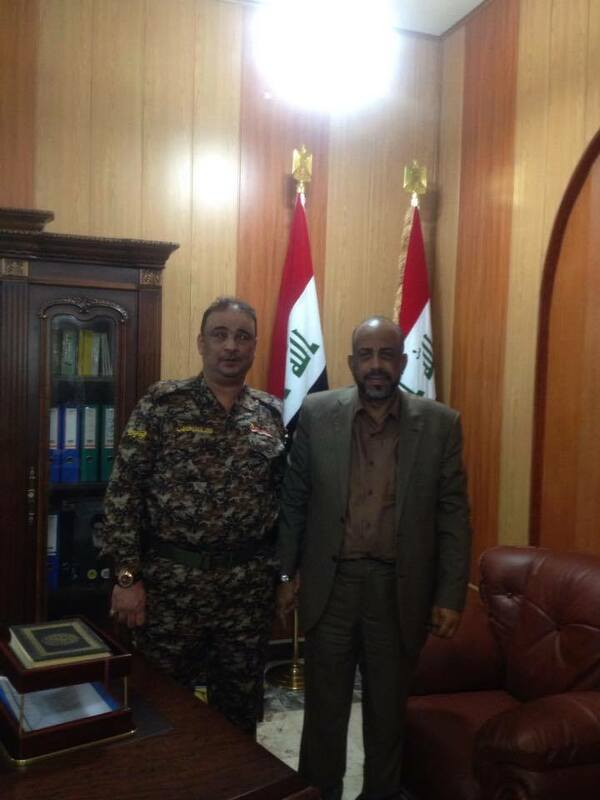 The raising of the banner of Abu al-Fadl al-Abbas reportedly in al-Awja, Tikrit area. Kata'ib al-Ghadab graphic: 'Islamic Da'wah Party Tanẓim al-Dakhil: the Military Wing: Kata'ib al-Ghadab'. Also features on left Abu al-Fiqar al-Shammary. Unlike other Shi'a militias, nothing in particular points to Kata'ib al-Ghadab efforts to demonstrate 'brotherhood' solidarity with other Shi'a militias. It will be of interest what information subsequently comes to light on this group's relations with those other militias. Ideologically, the Da'wah Tanẓim al-Dakhil is a pro-Iranian break-off from Da'wah Tanẓim al-Iraq, the original pro-Iranian break-off from the Da'wah Party. As a result, the group advertises Iran's Supreme Leader Ayatollah Khamenei in some of its posters.